The day after the Devi lunch that I had with my three girl friends, I’ve coordinated another lunch with another group of friends, Robyn, K, and Ariel to Cafe Boulud. K, Robyn, and I met up on time while we’re waiting a bit for Ariel since he’s traveling uptown from the Financial District, so we perused the menu and chatted a bit while we’re waiting for him. 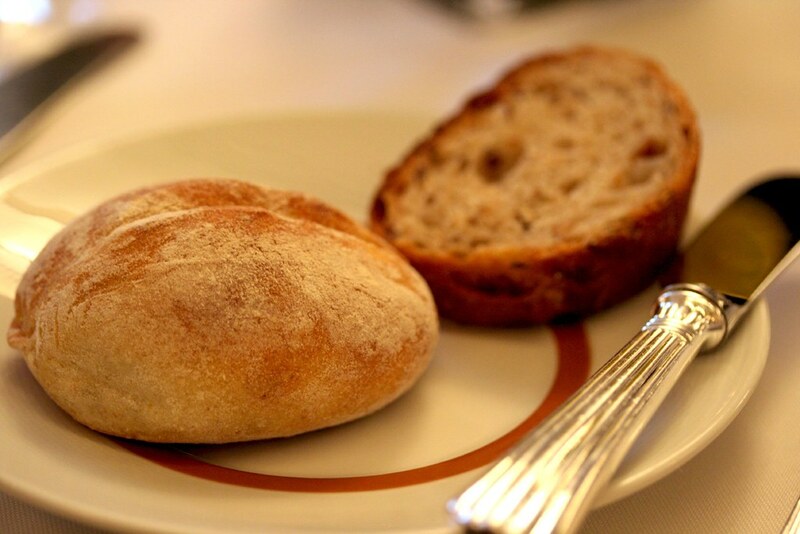 The bread server walked to our table and told us the options for the moment: a plain roll or a slice of pumpkin bread. 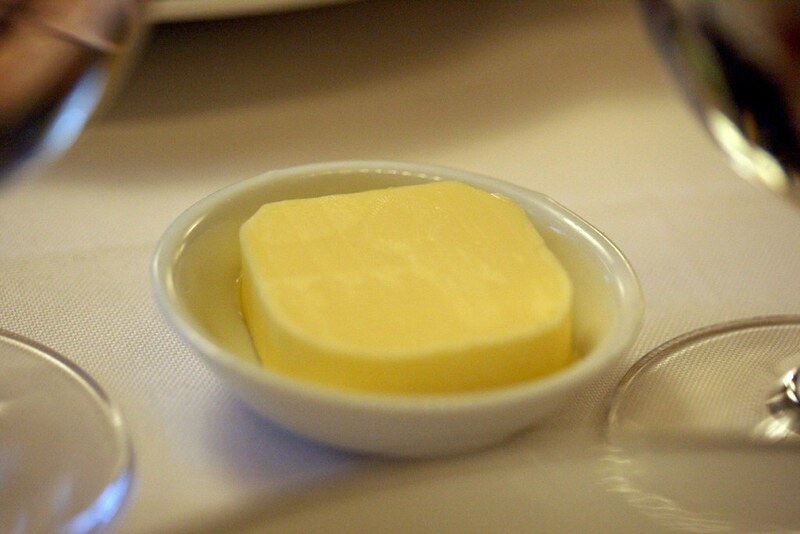 We all chose both and gave us soft butter. The plain roll was fine, but the pumpkin bread was better. It’s not so much as pumpkin flavored than I would normally expected – more like sourdough/yeast fermentation flavor nuanced with a hint of nutmeg and allspice and crunchy toasted pumpkin seeds. Then finally, Ariel arrived and we all ordered our food. 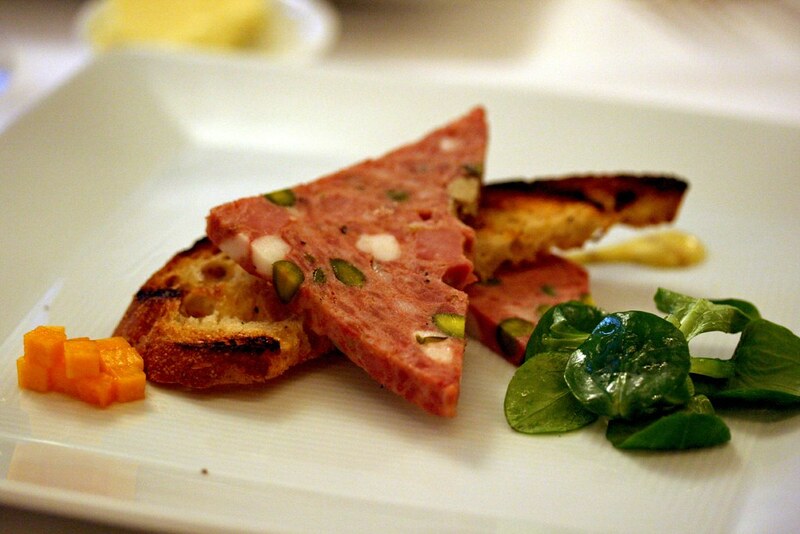 When it comes to the appetizer, only one dish really got our attention – the duck terrine. The terrine, a few slices of coarsely textured duck meat and fat mixed with pistachios was smooth with bits of crunchiness from the nuts and the toast points that accompanied them. The pain was actually trying to eat the terrine with a knife and fork since my toast was flying across the table whenever I’m cutting the toast into bite sized pieces, but the itself dish was fine. As for our mains, K and Ariel got the stuffed skate wing, Robyn got herself some beef stuffed two ways, and I got the mushroom raviolini. Basically, we all got to try a little bit of everything here. 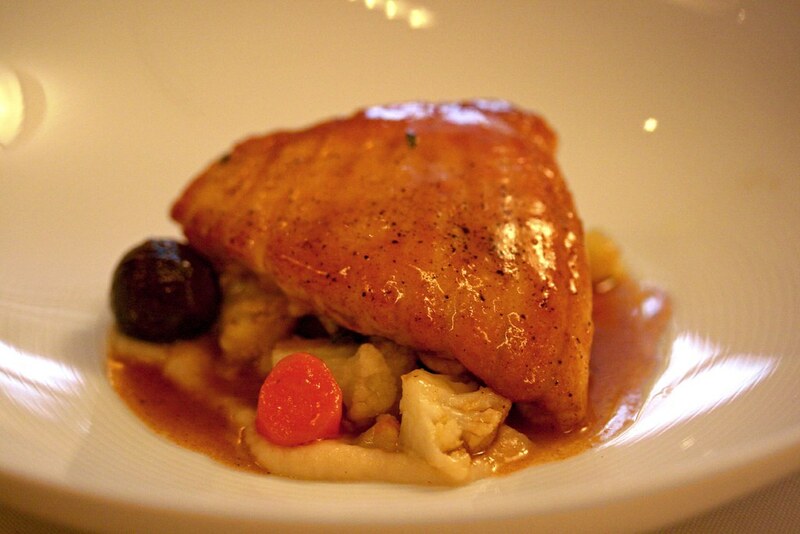 The skate was very moist, tender and sweet fish. The swiss chard delicately brought in a touch of pungent, bitterness – almost spinach-like to my tastebuds, while the caper relish brought a salty bite. It’s a nice combination but nothing extraordinary about the dish. Just good solid cooking. Robyn’s beef was very tender and cooked to a medium-rare. 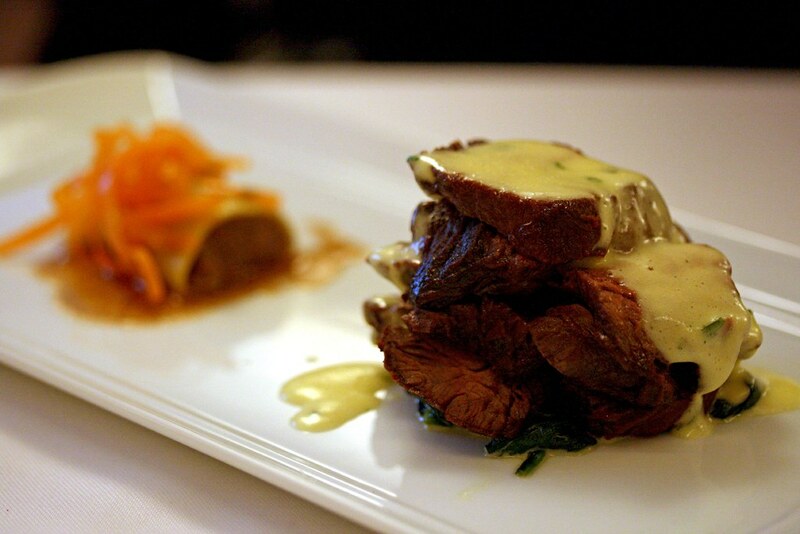 The bernaise sauce is a traditional accompaniment to steak. I haven’t tried the beef brisket cannelloni (the cylindrical item that’s blurred on the background) since it’s quite small. It’s executed nicely but I didn’t feel swooned by the flavors. 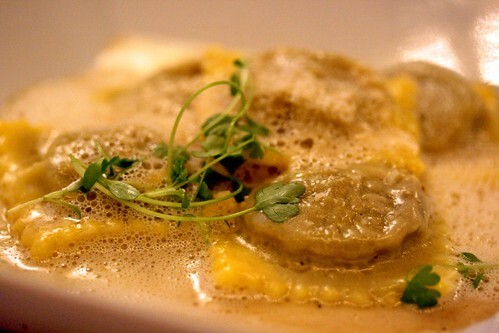 Finally, we move onto the mushroom raviolini. These pockets of pasta was very good. The pasta was al dente, the mushroom was intensely flavored, enriched with the port wine and shallots. The parmesan foam was a different take of the traditional shavings of parmesan cheese to top off the dish – it had the right balance of rich earthiness and pungent saltiness. After our plates were cleared, chatted amongst each other and our neighboring table for several minutes, we get to eat dessert. 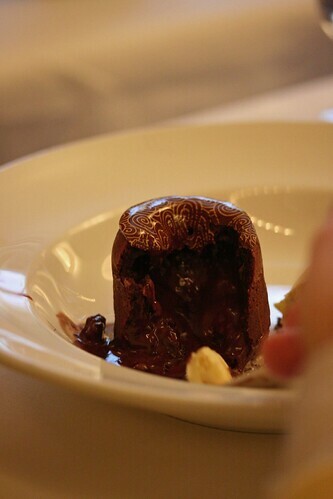 Ariel’s chocolate molten cake looks pretty with the mosaic design on top of the chocolate by the use of chocolate transfer sheets. (In case you don’t know what are chocolate transfer sheets, take a look here.) After Ariel dug into its gooey, chocolate center, I was surely beyond curious how does it taste and gotten myself a conservative bite since he’s still sick. 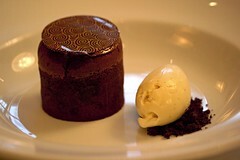 It was good – dark chocolate (say, 68% cacao content), smooth and thick with a thin exterior of a cake. Not to say I’m weak in the knees for it but it was fine for what it is. 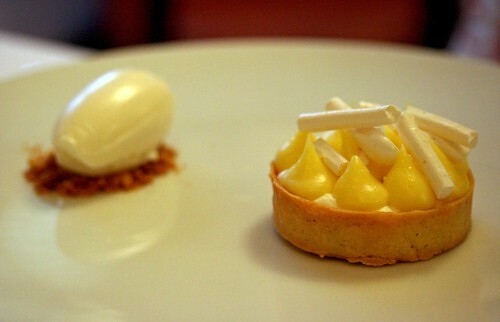 K had the Meyer lemon tart. It’s very adorable the way it’s presented – little mounds of Meyer lemon curd while the middle was filled with cream (I think? I didn’t take notes) and little sprinkles of meringue that Ariel thought they were marshmallows at first glance. The tart was smooth, light and refreshing with the slightly crisp, buttery pâte sucrée. Admittedly, I haven’t tasted the fromage blanc ice cream since it’s just a quenelle as a serving size. Everything was harmonious and tasty but I guess I was anticipating something more about this tart. Robyn and I had the peanut caramel milk chocolate tart since it’s the most unusual sounding dessert from the entire list of choices. 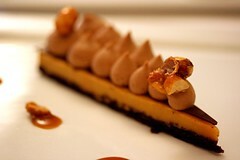 The thin, crisp chocolate pâte sucrée melded well with the peanut caramel filling, thin, dark chocolate (about 62% cacao) shell, and little piped mounds of milk chocolate mousse on top. It’s arguably a sophisticated form of a Reese’s Peanut Butter Cup but in a tart form and not as intensely peanut butter flavored and the addition of caramel as the main component. 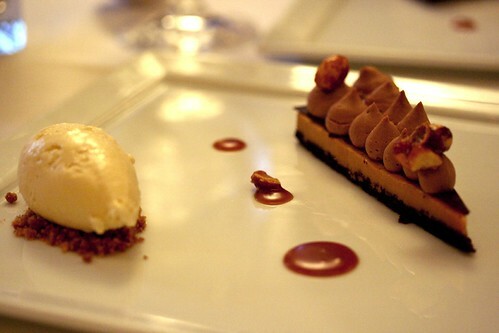 It tastes good and as well as the creamy, smooth peanut ice cream. Am I blown away by Cafe Boulud by this lunch? Not really. My thoughts after talking about our lunch briefly to Robyn’s boss, Ed Levine at Serious Eats afterwards (I’ll explain why in the next post), I think they “dumbed it down” since the food served at this time isn’t usually found in their regular menu and the flavors are pretty much standard, not extraordinary like what Mr. Bruni had raved about. I would give them a second chance but not during Restaurant Week. I wish I can eat there someday. Especially for the desserts. Helene: You will…if you’re coming down to visit to NYC. Didn’t they just get a new head chef there? One of the guys that was on the food network the next iron chef show? 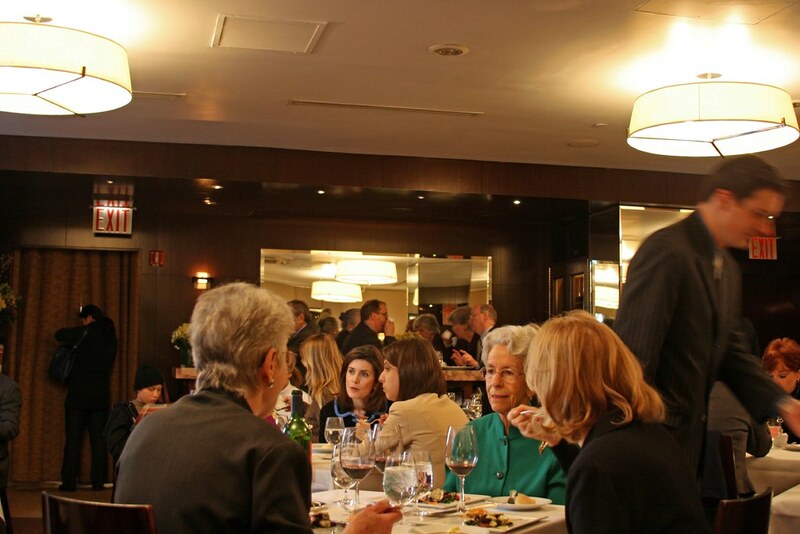 It definitely sounds like your restaurant week experience match some of my own, where the company exceeds the food. But hey, when the company is good, I don’t mind. also, you and kathy in the comments are hilarious. haha, you didn’t think they were hot. Danny: Oh yeah, Chef Bertrand Chemel left to Washington D.C. and it’s now Chef Gavin Kaysen to fill in his shoes. I’m not too surprised to hear your experience. I totally agree with you on good company. Your experiences during RW seemed to mirror mine to a certain degree, ranging from overall underwhelming to deeply disappointing. With such high expectations for some of these restaurant, sometimes plain, old “good” just won’t cut it.